Sean McVay is critical of himself. But that’s what he believes a good head coach and playcaller should be. Accountability is everything for the Los Angeles Rams, the only remaining undefeated team in the NFL. And it starts with McVay. The critique seemed harsh, if not unwarranted. The Rams, after all, had just won their sixth consecutive game — their second straight on the road, and Todd Gurley rushed for a career-high 208 yards. “I don’t want to be some Negative Nelly,” said McVay, brazenly aware of his harsh self-evaluation. But the reality is, the second-year coach points out what he must improve, knowing his team has the potential to go as far as he can lead them — and yes, that is a Super Bowl. The Rams feature the top-ranked offense in the NFL, Gurley leads the league in rushing yards and Jared Goff is fourth in passing yards. Goff, who has passed for 1,928 yards and 12 touchdowns with five interceptions this season, said McVay can be too hard on himself. 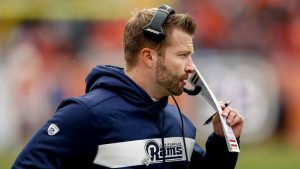 In the immediate aftermath of each of the Rams’ victories, McVay is quick to credit players, while often chastising himself, stating that he could have put his team in better situations.